Home > Membership > Nonprofit World > What Makes an Excellent Board? 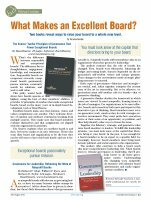 What Makes an Excellent Board? Two books reveal ways to raise your board to a whole new level.